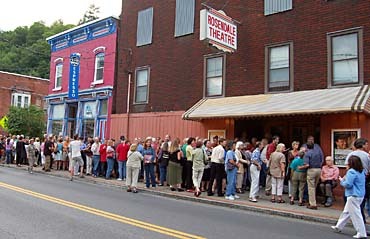 ROSENDALE � When Richard "F-Stop" Minissali, renowned photographer and councilmember on the Rosendale Town Board, helped inaugurate a preservation group to mastermind ways to continue the cultural acuity of the Rosendale Theatre, he didn't realize they'd end up vying for a national win from the Pepsi Refresh Funds contest. In the fall of 2009, when the theater went up for sale, Minissali and other residents worried it would be sold to developers who'd make it into apartments or a business that wouldn't nourish the town as the theater had for the past 61 years. As an anchor business and cultural center, "The Rosendale," as co-proprietor Michael Cacchio calls it, actually is the center of town businesses. Theatre groupies suddenly realized what they actually had in the town � a single-screen, family-owned theater with owners who knew their neighbors' names, took suggestions as to what to play, and basically treated patrons like family. What would happen if some outsider came in and made the building, once a vaudeville venue, into something that would change the face of the town? What if the landmark building was torn down and the theater footprint and its parking lot ended up being groundwork for condos? It seemed that, suddenly, people realized that, for just $6, an art, indie or a first-run movie could be seen with just a quick drive to town or even a stroll down Main Street. And for many, many years, the Cacchios have opened their hearts and doors to benefits for many causes � from the local library and resident misfortunes to social issues and local politicians. This was the spark initially igniting the formulation of the Rosendale Theatre Collective. Lisa and Uval Sterer of the Big Cheese, an business adjacent to the theater, had a preliminary meeting to see what could be done to save this cultural center. Minissali said, "I was invited to the second meeting with about six people in total; patrons of the theatre, Main Street neighbors, and film director, Nicole Quinn." Word spread, meetings ensued, and even local celebrities had gotten on board, joining the collective's 17-seat advisory committee. Among them are actors Aidan Quinn, David Strathairn, Melissa Leo, and Denny Dillon; Philadelphia screenwriter Ron Nyswaner; and author Kim Wozencraft, whose novel, Rush, was made into a film starring Jennifer Jason Leigh. And F-Stop Minissali became the chairman of the RTC. Said Minissali, "I was sick last year and the community gave a lot of support to me, so I wanted to give back. I was not working fulltime so I had the time to do something like this�wrestle the beast to the ground." Since then, the Rosendale Theatre Collective, a seemingly ever-growing ad hoc group, set about obtaining nonprofit status and, gratefully, worked under the Children's Media Project's nonprofit status until they recently got their own 501 (c) (3). Donations to a nonprofit are lawfully tax-deductible and the RTC has been the recipient of $100,000 in donations and fundraising revenues so far towards the $160,000 needed to secure the mortgage to purchase the theater.. But they didn't stop there. On March 1, the Collective entered the Pepsi Refresh online contest, whose web site states: "We're looking for people, businesses, and non-profits with ideas that will have a positive impact. Look around your community and think about how you want to change it." Perfect. And now, at the time of this writing, the Collective is "Number One" in their category for the $50,000 prize. "We started out as number as number 18 and today, [April 12], we're number one," said Minissali. So who thought of spreading-the-wings to enter a national contest? "I think it was Eve Waltermaurer, co-chairperson of fundraising. She's has been doing most of the grant-writing and applications for the RTC and I think she found it," said Minissali. He explained that the 60-second video required to enter the Pepsi contest was put together by Waltermaurer. The video, a pictorial history of still photographs of former entertainment performances at the theatre, can be seen on the RTC web site at rosendaletheatre.org and also on the Pepsi Refresh page detailing the desires and goals of the Collective. The next step was getting word out for people to vote on a daily basis to help the Collective win the contest funds. Minissali said, "We put a whole plan in place; a press release, a Facebook announcement, emails for people to vote daily," he said. Minissali even turned to his kids for help. "I said to my kids, 'What can you do to help?' and they put it on their Facebook pages to tell their friends." "Then a Facebook friend of my son asked if she could put it on her Facebook page to send out to 500 other friends, as she felt the cultural aspect was a good cause," he said. He strongly feels the new "social media" of internet presences such as Facebook and Twitter has made this process easier. First place for $50,000! However, Minissali said his only regret is that they didn't apply for the $100,000 prize. Nevertheless, with 15 more days to vote, he requested that everybody go to the Pepsi Refresh site at www.refresheverything.com/rosendaletheatrecollective. In addition, the Collective wishes to help other organizations to win for their respective causes by encouraging voters to also vote for the Hudson Valley Youth Wind Ensemble (HVYWE) and Lancaster Conservatory of Music that helps provide quality instruments to needy students. This collaboration of the three organizations requesting votes for each other will improve the chances of all three deserving groups by increasing their votes by reciprocity. The theater's co-proprietor, Michael Cacchio said, "The family is just thrilled that they [the RTC) are looking every place possible for innovative ways to make money. Not just their interesting list of fundraisers they've been having; but even on a national scale. It really reinforces our optimism on their integrity to keep the theater a vital business in the community."